Creating a new adaptation of Jane Eyre, a novel that has been the subject of generations of theatrical, musical and screen versions, may seem like a frightening task. The 1846 classic by Charlotte Bronte has enjoyed unfading popularity and well deserves a fresh stage production, yet how is this to be done in 2018? Should a writer bring her own emphasis for a contemporary audience? Or aim to let the powerful original narrative speak for itself? Janys Chambers and Lorna French's script is both faithful and energising. Their passion for the novel shines through every line. Chambers first fell in love with the story as a ten year old - the same age her heroine appears in scene one as a book lover and deep thinker. Her version condenses the drama, deception and romance of the story in two hours of cleverly constructed dialogue. The action is brought to life with some daring stagecraft under the direction of Elizabeth Newman. The Octagon Theatre is well fitted to show Jane's developing character and resilience under the trials of life and Newman makes full use of the venue's assets. The story's dark secret first appears where we least expect it. Props are kept to the absolute minimum but utilised to the maximum. Even the novel's animals are reproduced convincingly in an off stage effect. Scene changes are executed with meticulously timed choreography, perhaps benefitting from Newman's background in ballet. Yet this production's greatest strength must surely lie with its cast. From the opening scenes of Jane's unhappy childhood, the young company give an outstanding portrayal of unrestrained childish nastiness. Che Tligui is the overindulged bully John Reed, Zara Richardson-Browne is his sidekick little sister Georgiana, alternately fawning and exasperating. Jane suffers the combined force of their brutality. Two hours is far too short to do full justice of the scope of Jane Eyre, and corners were inevitably cut. Jane's school years were defined mainly by the adults: the kind intelligence of a female teacher pitting her wits to temper the heartless authority of the headmaster. I would have preferred a greater development of Jane's closest friend- a suffering saint and one of young Jane's greatest influences. The play comes into its fullness with the advent of its adult characters. Jessica Baglow as mature Jane resists melodrama wonderfully. Her portrayal could be any young teacher fighting to give her pupils an education in a world that has flung them into life with abundant opportunity, but without the basic needs of family and love, a lot like Jane herself. Michael Peavoy presents a better Rochester than I have seen in any film adaptation. The famous verbal interchanges between Jane and her employer will not disappoint the most demanding Bronte fan. With other players fulfilling multiple roles there is perhaps a risk of confusion for those new to the story. The simplicity of the set design did not help to emphasise changes of location and time. Yet the brilliance of the cast never wavered. Claire Hackett provided some humour with her genial Mrs Fairfax and was equally absorbing as the guilt tortured Mrs Reed. Leah Walker's Bertha chilled me to the bone - a soul wrenching portrayal of mental illness hurting those its victim loves. Jane Eyre remains highly relevant as a tragedy and a romance. This double dose of powerful acting and resonant writing bring a production that enriches the work of Charlotte Bronte. Read the book. Enjoy the play. 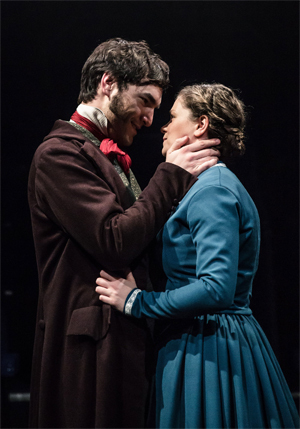 Jane Eyre is on at Bolton Octagon until Saturday 10th February.